Santa Barbara Board of Supervisor Gregg Hart passed a resolution of commendation this week honoring Freedom 4 Youth, an incredible local grass-roots nonprofit organization that has provided transformational leadership & education, mentorship & advocacy, economic self-sufficiency programs, and diversion & re-entry services to at-promise youth and their families inside and out of our juvenile justice system for the past decade. 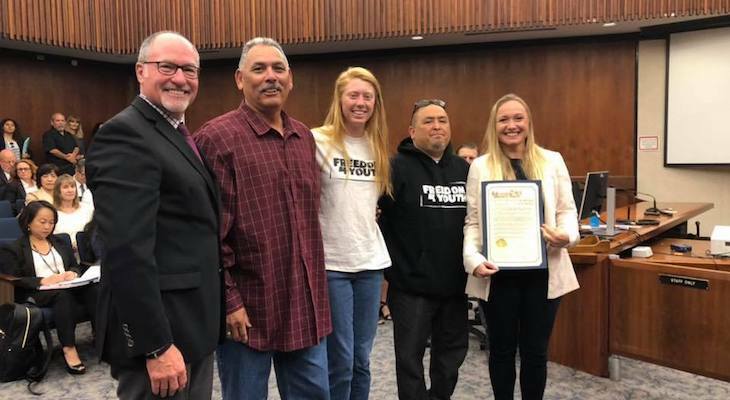 Freedom 4 Youth works collaboratively with the Santa Barbara County Probation Department, Workforce Development Board, and other community partners in working to empower youth, initiate criminal justice reform, and improve public safety in our County. Freedom 4 Youth's individualized support of helping youth transition from detention to freedom by identifying satisfying careers, pursuing higher education, and nurturing healthy relationships with their families is a collection of services that no other community organization provides. The relationships formed with youth and their families are long lasting as many youth go on to serve as volunteers for the organization. Engaging true interactive community mentorship, Freedom 4 Youth's UCSB campus affiliate, the Freedom 4 Youth Advocates, visits and serves the youth of Los Prietos Boys Camp every week and also provides support services to the youth outside of carceral facilities. These volunteer mentors have provided over 26,000 hours of service to local youth since 2012 and continue to sponsor the Freedom 4 Youth Annual Leadership Conference each year. F4Y's 7th Annual Leadership Conference is happening next month from May 16-19, 2019 at both UCSB and Los Prietos Boys Camp. It was at UCSB that Ethan Bertrand, a District Representative for the Santa Barbara County Supervisor Hart, attended Professor Mario Galicia’s class titled “Plantations to Prisons” and was "absolutely blown away” after hearing a heart-centered presentation given by a youth who benefited from the support services and now volunteer for Freedom 4 Youth. This incredible experience was coupled with Bertrand and Supervisor Hart's visit to Los Prietos Boys Camp last month where they heard amazing things about the organization from the Probation leadership team. Bertrand stated he was so impressed by F4Y and their decade of service that his office would love to honor Freedom 4 Youth with a Resolution from the County of Santa Barbara. Freedom 4 Youth is a 501(c)(3) not-for-profit with a mission of empowering at-promise youth and reducing recidivism in the juvenile justice system. The Co-Founder Billi Jo Starr, had a vision for empowering youth to break the bonds of past limitations so she began volunteering her time at the Los Prietos Boys Camp teaching “Leadership Development, Listening, and Effective Communication” classes twice per week starting in 2008. Starr quickly saw a legitimate community need to support at-promise youth, and as her work grew, so did her vision. Billi Jo Starr is currently completing her PhD in Education at UCSB and is graduating this June. For more info and to volunteer please visit the Freedom 4 Youth website: www.freedom4youth.org or call (805) 708-1292.